My first Winter Birch Forest Painting sold almost immediately. It has gotten more feedback than any painting I have done so far, and it was painted to specific requirements of the interior designer for the space it was to hang. So when it sold, I knew I had to expand the series and do a new Winter Birch Forest painting. 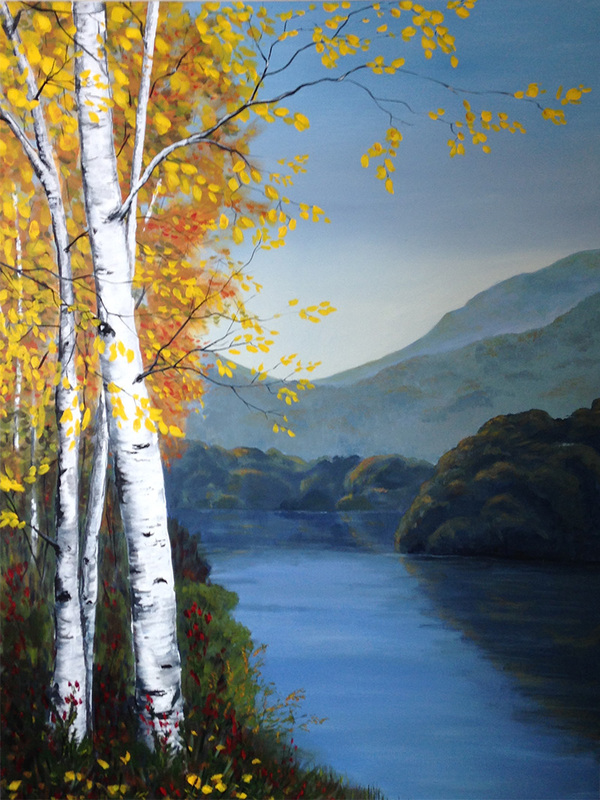 Ultimately I plan to do a “Birch Forest” series encompassing multiple paintings in all four seasons. I really enjoy conceptualizing these birch forests, and choosing the birds to put in them. The choices are usually influenced by the birds I have been observing out my window the days prior to painting, and this time our resident downy woodpecker has been making the rounds. I filmed the painting of both of these paintings and with some luck will be putting up a time-lapse video of the first of these on YouTube soon for those who would like to see how I approach these. Its possible I will do a short teal-time demonstration of how I paint the birch trunks with a little more detail. Its my goal to share how I learn and paint with anyone who is interested, as that is how I learn myself. 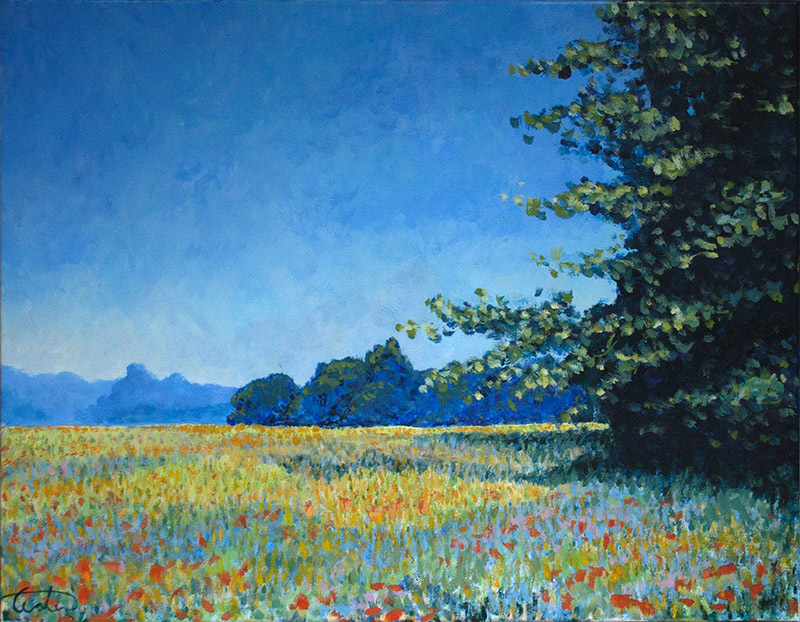 This painting is 16″ x 40″ x 2″ and the painting extends around the edges. 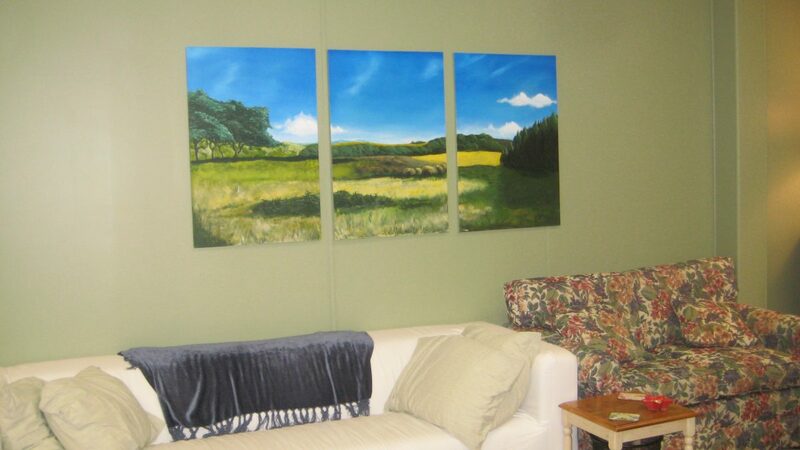 It is currently on display at the Mad River Barn Inn and Restaurant in Waitsfield Vermont for anyone passing through. Hope you enjoy it as much as I enjoyed painting it! I thought one of my first posts should be about how I got started, or re-started, painting. And what that experience has been like. If you read my “about” page you’ll get a good summary of how I painted for a while in high school, and held an interest in art for the next 30 years without painting much at all. In the last couple of years however I started painting again. And the experience has been both rewarding and challenging. The challenging part comes from a variety of sources. First being learning to paint in acrylics. I chose acrylics over oils, which is what I painted with in high school, primarily because my first painting had to be done, and dried, quickly in order to be ready on time as a surprise gift for my wife. However I may have chosen acrylics over oils anyway because I like the idea of them drying quickly, and not having to use turpentine and other solvents. I was not ready for the difference fast drying time would make for things like blending and reworking the painting. I like the idea of being able to paint over mistakes, but sometimes I think it would be easier if I could scrape off and blend my mistakes instead of having to paint over them. And not having the extra time to work the paint can be quite the challenge. Challenge number 2. While I took some lessons in high school I either did not learn much or forgot everything. So I had to learn all over again. How does one go about learning to paint without finding a teacher or class, and spending lots of dollars and time wasted between lessons? You Tube of course. That and the internet in general. But a quick search on You Tube and all of a sudden there were all these free resources to get me started! Yay! Of course free is what you pay for it. There is a lot out there and one artist disagrees with another about what is right and how to go about painting. So you have to sort of be careful and look at a lot of material to see what might be of value and what won’t. And, and this is a big “and” you need to be careful that you are not just copying what others a doing and not learning your own way of painting.